The SD1 produces the warm, smooth distortion of an overdriven tube amplifier while maintaining the subtle nuances of your picking technique. Boss's unique asymmetric overdrive circuitry delivers a genuine overdrive effect for a classic guitar sound. A tone control is also provided for precise tonal adjustment. Smooth, round, fat distortion--the sound of tubes being pushed past their limits. The overdriven sound that the electric blues and rock were built on. That's the sound you'll get with the Boss SD1 Super Overdrive Pedal. Its unique asymmetric overdrive circuitry delivers a genuine overdrive effect for a classic guitar sound that still maintains the subtle nuances of your picking technique. And so you can get your tone just right, there's a Tone control knob between the Level and Drive knobs. No, there's nothing complicated about this pedal--just some great engineering and a sound that stands the test of time. A lot of digital distortions out there could take a lesson from the SD1. Uses 9-volt battery or PSA-120 adapter (not included). 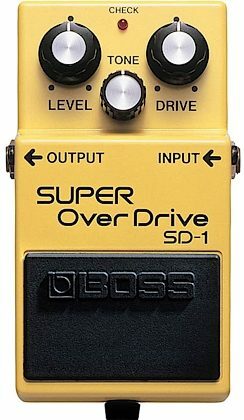 The Boss Super Overdrive pedal is a classic, powerful, yet affordable pedal. It's Boss' take on the classic Tube Screamer circuit with more transparency and extra gain. Players like Eddie Van Halen and Jonny Greenwood have famously utilized this secret-weapon pedal for decades. It can cover numerous overdrive tones ranging from barely-there gain, to full-out distortion by just adjusting the Gain knob. No matter what style of music I'm playing, I always have the SD-1 in my chain -- whether I'm using it as a stackable overdrive pedal, or lowering the gain to near-zero and boosting the Level knob to essentially turn the pedal into a great clean booster. It really does emulate the cranked tube amp sound pretty faithfully, and responds well to your dynamics and touch. Sound: I equate overdrives like wasabi or cayenne pepper...its got no real flavor of its own until added on top of something. Although, id say the sd 1 adds a nice high mid to your tone. Lots of extra grit on tap too..im sure out there would be curious to know that. Just remember..its overdrive, not distotion. Overdrives are transparent and sit on top of a sound, thus if you play clean channels with an od on, youll still hear the clean signal clucking under it. a distortion is for masking or creating a channel. If you play a clean channel then kick on a distortion, you basically just created a dirty channel. Feature: Just perfect actually Ease of Use: a caveman can do it Quality: Its a boss...their stuff has always seen the worst and managed to keep working. Value: Considering how many idiots will spend 200 and up for something as simple and plain as an od, this is an absolute steal. It does exactly what an overdrive is meant to do. Od pedals have no business in the boutique world.its like people trying to make a gourmet french fry and charging a premium for it. at the end of the day, its still a classless french fry. An od is still an od. Manufacturer Support: Never needed it The Wow Factor: Lets say this again...its just an overdrive. It has no character on its own. Its sole purpose is simply pushing an amp Overall: all guitarists need an od at some point. So its nothing special, and these types of pedals arent supposed to be. Its job is usually done well no matter how much you spend. Sound: I liked the overall sound a lot. The only real con is that, depending on the level, there is a high amount of feedback from the amp, though this could be worked on. Feature: The knobs are relatively easy to understand. High quality metal framework and no-slip rubber. Ease of Use: Small, fits on most pedalboards (I have a PB1000) and, as aforementioned, the knobs are simple enough. Quality: You could throw this thing out of a moving car and it will probably still work. Value: Besides on zZounds, I have never seen this pedal under $45-50. I think it is better to get this than to give in to a cheap pedal or maybe to even wait for a more expensive pedal. Manufacturer Support: zZounds.com was accurate in the shipping progress, and Boss was right to boast about its quality and features. The Wow Factor: It is very good-looking, unlike the EHX Big Muffs that you basically have to dedicate space to -- the rubber is no-peel, and the metal frame and construction are great. Overall: This is a very nice pedal; it delivers hi-fidelity sounds to your amp. If anything, it has a bit of feedback and, if not kept up, isa bit squeaky when pressed.